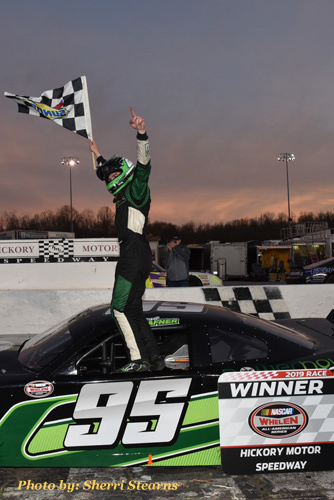 3/16/19 - The 2019 Hickory Motor Speedway season would get off to a great start on Saturday night with nice weather, an infield full of race cars, and action packed racing across every division. Leading off the evening's events would be the first of two 40 lap features for the NASCAR Whelen All-American Series Late Models. The top 4 qualifiers would best the old track record set by Jr Motorsports hot shoe Josh Berry. Two time Hickory Motor Speedway Track Champion Austin McDaniel in the #12 would start from the point after dropping the track record to a blistering 14.666. Bradley McCaskill in the #07 would venture out to Hickory Motor Speedway to prepare for next week's CARS Tour race and do himself proud also besting the old track record and rolling off in the second position. 2018 Hickory Motor Speedway Champion Jacob Heafner in the #95 would start third after also turning a track record run in qualifying. Rounding out the top two rows would be the #31 of Thomas Beane starting with fourth after being the first driver in qualifying to top the old track record. McDaniel would battle side by side with McCaskill for several laps before finally nosing ahead. Heafner would take up where he left off in 2018 and pressure for top spot until finally moving to the lead. A caution near lap 20 would bunch the field back up and Lap 28 would see an accident that would have lasting repercussions with contact between the #21 of Travis Swaim and McDaniel. Both cars would be finished for the race. Racing would resume and find Heafner battling with teammate Justin Carroll in the #57 for the top spot. Heafner would pull ahead and leave the battle for second between Carroll and Beane. Heafner would drive on to the checkered flag. Beane would win the battle for 2nd with Carroll taking 3rd. McCaskill would go home in 4th and Charlie Watson in the #9 finished 5th. Next up would see the Street Stocks hit the track for 30 laps of side by side action. The front row would be made up of Gary Ledbetter in the #32 and the #7 of Jeff Sparks. Ledbetter and Sparks would battle for several laps, but soon settle in line. Positions three and beyond would stay side by side for multiplel laps allowing the leaders to stretch their lead. The caution would fly on lap 19 as Sparks would spin after contact on the track. The field would bunch up for the restart with Ledbetter at the front with the #64 of Marshall Sutton to his outside. Sutton would hold his own on the restart and pull ahead going down the backstretch. Mechanical issues would see Ledbetter pull to the pits while the #16 of Jonathon Smith and Sparks would work their way into the battle for the win. Sparks would move around Sutton to the top spot with a couple laps to go and hang on for the checkered flag. Sutton would finish 2nd and Smith would take 3rd. Mark Whitten in the #77 would battle back for 4th and Todd Bradbury in the #00 would finish 5th. The Paramount Auto Group Limited Late Models would roll off next for 50 laps in Round 1 of the Paramount Kia ‘Big 10' Racing Challenge. 2018 Paramount Kia ‘Big 10' Racing Challenge Champion Gage Painter in the #12 would take the top spot in qualifying with the #99 of Kyle Mansch to his outside. Josh Kossek in the #44K and Mitch Walker in the #43 would make up row two. The battle up front would be close but Mansch would have a nose ahead when the caution would fly on lap 2 for a huge 7 car crash on the front stretch. All drivers would be okay, but several cars would enter the pits on the wrecker. The restart would once again bunch the field with Mansch and Painter at the front. Painter would get the better restart and pull back to the front. Battles would rage throughout the field but Painter would use their battles to build a commanding lead. Painter would drive on to the win with the #25 of Zachary St. Onge finishing 2nd. Kossek would hold on for 3rd, Kyle Barnes in the #44 would finish 4th, and Mitch Walker in the #43 would finish 5th. Rolling off next would see the always exciting Carolina Custom Golf Carts Super Trucks doing battle for 35 laps. Joey Shuryan in the #30 would set the fast time in qualifying to start from the top spot with the #26 of Charlie Neill close behind to his outside. Shuryan and Neill would duel side by side on lap 1 till Shuryan would spin on the high side in turns 3 & 4. This would bring about a full restart with Neill at the point with Gander Outdoor Truck Series competitor Spencer Boyd in the #4 to his outside. Neill would pull to the lead on the restart, however the caution would fly again with an incident involving the #28 of Dennis Trivette. The restart would once again see Neill move to the lead over Boyd. The caution would fly one last time on lap 20 for a single truck incident involving the #86 of Joe Simpson. Neill would once again move to the top spot on the restart and not look back as he would drive on to the win. 2018 Champion Allen Huffman in the #51 would overcome a difficult starting spot after not getting to qualify and finish 2nd while Boyd would finish 3rd. Shuryan would bounce back from his early spin to finish 4th and Zach Hale in the #97 would grab 5th. The 4-Cylinders would hit the track next for their 25 lap feature. Curtis Pardue in the #17 would start from the pole position with Dennis Ward in the #25 starting to his outside. Ward would jump to the early lead and stay there for the first 10 laps. Pardue would battle his way back to the top spot and regain the lead. Pardue would hang on and grab the victory with Ward finishing 2nd. Cody Combs in the #9 would finish 3rd, Allison Houston in the #29 would come home in 4th, and 2018 Champion Brian Mundy in the #6 would encounter mechanical problems and finish 5th. Next up would see the Renegades roar to life for their 20 lap feature. After qualifying, Danny Crump Jr in the #97 and Spencer Dickinson in the #6 would start from the front row. Crump would jump to the early lead and the caution would fly on lap 2. Crump would regain the lead on the restart but would spin in front of the field on lap 5. Robbie Hollifield in the #51 would restart from the point. Hollifield would face furious challenges from Justin Austin in the #40 and Brian Larkin in the #7 but would hang on for his first Hickory Motor Speedway victory. Austin would finish 2nd with Larkin taking 3rd. Crump would battle back to finish 4th and the #95 of Rodney Elkins would finish 5th. Finishing out the night's racing would be the NASCAR Whelen All-American Series Late Models hitting the famed 3/8 mile oval for the second of their twin 40 lap features. With the invert from the finishing order of the first race Ryan Millington in the #15 would start from the top spot with Leland Honeyman in the #4 to his outside. Millington would take the early lead until the caution would fly after a hard crash between the #9 of Charlie Watson and the #95 of Jacob Heafner. Heafner would be able to continue, but Watson's car would be finished for the evening and there would be controversy between the two wheelmen. The restart would see Millington and Adam Lemke in the #98 starting from the front. Millington would move ahead to the top spot as the caution would fly on lap 15 for an incident between Honeyman and the #51 of Jeremy Pelfrey. Both cars would be able to continue but have to restart from the rear. Millington and Lemke would once again restart from the front row. Lemke would make the move to the front and grab the lead. Millington would pressure Lemke hard over the remaining laps, but would also face a strong challenge from the #28 of Chris Hudspeth. Millington would look to have the inside line going into turn three on lap 38 but Lemke would shut the door before the pass could be made. 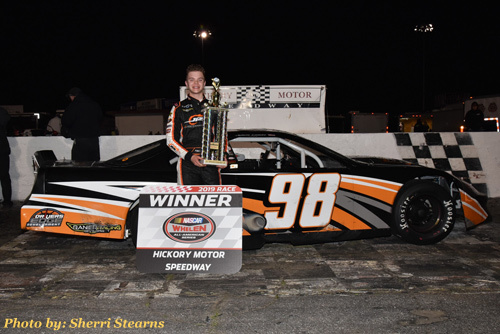 Lemke would hang on and grab his first hickory Motor Speedway win. Millington would have to settle for 2nd with Hudspeth finishing 3rd. The #57 of Justin Carroll would finish 4th and Thomas Beane in the #31 would finish 5th. Next week will see the Cars Tour return to Hickory Motor Speedway for the MTP Tire 300 for 150 Laps for the Late Models and Super Late Models. Both divisions should have a full field of some of the best stock car drivers in the country. In two weeks the NASCAR Whelen All-American Series roars back to life with a full slate of racing action at America's Most Famous Short Track. For more info check us out at http://www.hickorymotorspeedway.com , on Facebook, Twitter, Instagram, or call 828-464-3655.